Finally! It's done. 9(>_>) I can't tell you how long this took to complete. I believe about 3 months. I had to find the right scans, and other elements to make it work. Well, this idea came to me because Lelouch likes to play chess like it's some kind of poker game, so I decided to make him play poker since he likes to gamble with lives and whatnot. Anyways, Lelouch ends up with a Royal Flush, according to the ending of R2. I used this pattern for each character because Suzaku survived Lelouch but Lelouch had control over the other characters either by using his Geass or as Zero. Nunnally comes as Queen because she lead the world after the Rebellion and Prince Schneizel was under Zero's control, therefore under her control and Kallen was under everyone, but still an important character. *NOTE* I didn't add C.C. because to me she's like a wild card (Joker) and since Jokers aren't used in poker she wasn't added. I had considered adding her as one when I read the first 4 comments that were posted. I might consider it. I will also consider making it widescreen as well. Like I said it took some time to do this. I do appreciate all comments and favs though. 11.28.08 - Per fan request. I 've added C.C. and made it into a widescreen. I think that the widescreen one looks better. I might just start going wide on my new wallpapers. Already said this at AP... nice idea, Rin-chan! >.< And finally, someone use my Suzaku vector! A very clever wallpaper indeed and I love the idea of making C.C. the Joker how classic! clever.....i luv the originality of tis! The left side looks a bit empty but Lelouch's shadow kind of sets it for good. A +fav from me, and this goes straight to my desktop! Cool idea, and good composition. I like the idea of having Lelouch's shadow over the cards, but I think the shadow should be blurred a bit, 'cause shadows generally are not that sharp, esp a shadow that's pretty far from the original object. 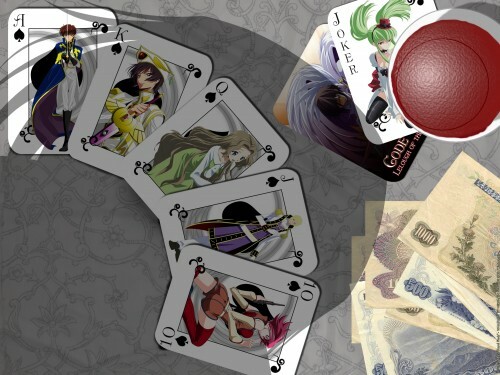 ^^ this reminds me about the cards that my sister bought and they were also from the Code Geass series! Although they arent as nice as the ones in your wallpaper. I really like Lelouch's shadow! It makes me thing that he is concentrating..I also like the way you chose the right terms for each people! Thats how i generally see them. I adore the concept! XD It's very original. omggg nice! love the concept. code geass and royal flush. damn cool (: oh and is that wine..? Only,that glass looks kinda odd,and the texture on it is too strong I think.. This is one of those wallpapers you simply *have* to love! The idea, the realization... your concept was really great, and the final result is really, really cool. amazing, simply amazing. esp when code geass is such like a card game. Really nice and original~ Wonderful job!